On July 19,2014 Lizzy Njideka Nnewi died by strangulation.. Yesterday the man accused of Killing her explains what really happened. A 37-year-old businessman, Kelechukwu Williams Chukwuanugo, who allegedly murdered his lover Lizzy Njideka Nnewi, by strangling her with her wrapper, yesterday told a Lagos High Court, sitting in Igbosere that he had no intention of killing the deceased whom he claimed to be in love with. Chukwuanugo, who opened his defense sobbed while giving evidence, in a count charge of murder preferred against him by Lagos State. The defendant was first arraigned on January 20, 2016 and was remanded in prison custody. The Lagos State prosecutor, Yusuf Sule, had called five witnesses and had closed its case. 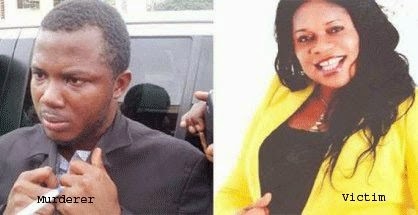 At the resumed hearing of the matter yesterday, Chukwuanugo who was led in evidence by his counsel, Mr. C. J. Jiakponna, narrated how he met the deceased, Lizzy Nzewi, a divorcee with four children, in Ghana sometime in 2012 and how they became lovers. He narrated how his late girlfriend helped him to obtain an International passport, a driver’s licence which bore same name with hers, in order to make it look like they were a couple. Narrating how life was snuffed out of her, he said: “On the fateful day, the deceased went out and stayed till midnight. She did not answer any of my calls on her mobile phone. When she arrived, she was drunk and was loudly playing loud music in her car. “I took her inside the house and told her to take her bath because she smelled so bad. “When she went inside the bathroom, I dialed her phone to check if it was actually on silence as she claimed, but it rang out. She came out to answer the call but found out I was the one calling. “She came out, snatched the phone from me and we started fighting and struggling for the phone. She held my manhood so hard, I tried to free myself then held her neck. The wine on the table which I was drinking poured on the floor, we slipped and fell down. I saw that I was bleeding so I entered the bathroom to cleanup. When I came out, she was still lying on the floor motionless. I shifted her and saw that she was already foaming from the mouth. The defendant said when he was arrested, he was taken to the hospital for treatment. However, his counsel made an application to the court to allow him summon the hospital to come and give evidence in court. He also asked the court to allow him apply to the Police to produce in court the defendant’s international passport, drivers’ licence and the ATM card seized from him. Consequently, Justice Akintoye, adjourned the case till May 10 for continuation of trial.